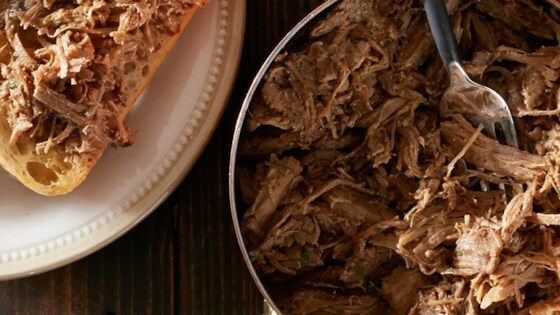 "Get cozy with this scrumptious slow-cooker meal from Lindsay Ostrom of Pinch of Yum." Line your slow cooker with a Reynolds(R) Slow Cooker Liner. Place the pork, soda, garlic, chili powder, oregano, and Worcestershire sauce in the slow cooker. Cover and cook on high for 4-5 hours or low for 6-8 hours. When the meat falls apart easily, remove the meat from the slow cooker liner and transfer to a cutting board. Shred it with two forks. Place meat back in the lined slow cooker and add the balsamic dressing and stir with the liquid in the slow cooker. The meat should be saucy and moist. Preheat the oven to 400 degrees F (or use the broil setting if you have that) transfer the mixture to a baking sheet lined with Reynolds Wrap(R) Aluminum Foil. Spread it in an even, thin layer and cook in the preheated oven until the juices are bubbling and the edges are crispy, 10-15 minutes (5-7 minutes if you have a broil setting). Use Reynolds Wrap® Aluminum Foil and Slow Cooker Liners® to ensure a quick and easy clean up every time! You can also whisk the juice of one orange and a spoonful of honey together and drizzle it over the meat before broiling for an extra flavorful browned exterior.